Most online communities, such as discussion forums, file-sharing communities, e-learning communities, and others, suffer from insufficient user participation in their initial phase of development. Therefore, it is important to provide incentives to encourage participation, until the community reaches a critical mass and “takes off”. However, too much participation, especially of low-quality can also be detrimental for the community, since it leads to information overload, which makes users leave the community. Therefore, to regulate the quality and the quantity of user contributions and ensure a sustainable level of user participation in the online community, it is important to adapt the rewards for particular forms of participation for individual users depending on their reputation and the current needs of the community. An incentive mechanism with these properties is proposed. The main idea is to measure and reward the desirable user activities and compute a user participation measure, then cluster the users based on their participation measure into different classes, which have different status in the community and enjoy special privileges. For each user, the reward for each type of activity is computed dynamically based on a model of community needs and an individual user model. The model of the community needs predicts what types of contributions (e.g. more new papers or more ratings) are most valuable at the current moment for the community. 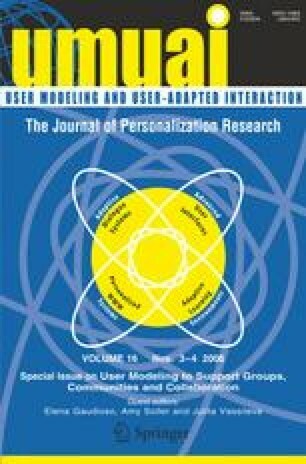 The individual model predicts the style of contributions of the user based on her past performance (whether the user tends to make high-quality contributions or not, whether she fairly rates the contributions of others). The adaptive rewards are displayed to the user at the beginning of each session and the user can decide what form of contribution to make considering the rewards that she will earn. The mechanism was evaluated in an online class resource-sharing system, Comtella. The results indicate that the mechanism successfully encourages stable and active user participation; it lowers the level of information overload and therefore enhances the sustainability of the community.